Now, you have likely passed by this place often and may have never gone in. It’s very unassuming and looks like an old diner with those vintage combinations of brown and green with some yellow (definitely vintage). This place will not win any awards for interior decoration – it’s the way it is; old school. It is still clean and the people are nice. In fact, I like going to these time capsules once and a while because it reminds me of what things were like back in the day. 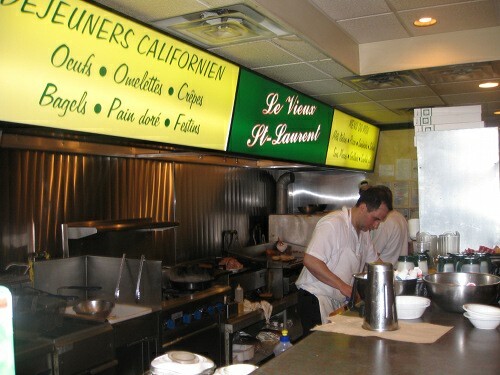 Once you walk in you see tables all along and a large counter with an open view of the grill. I could not help but stare at the food being made and a large pile of food on the grill waiting for hungry patrons to come in and chow down, and fortunately I was one of them. The menu is quite broad and covers most of the staple breakfast dishes with most of the items being under $10, although missing from the menu were waffles and eggs Benedict which is my personal favourite, but there are so many other items that you are guaranteed to find something you like. Most plates come with coffee and free refills. The menu has all the classics like: 8 types of French toast from $6.50-$10.95; omelets (served with a side of potatoes) weigh in with 15 choices ranging from $8.25 -$10.50 and for an extra dollar you can switch the cheese to feta. There is a classic egg plate section priced between $6.35 to $12.95, they have a happy face item ($6.35) which is two eggs as eyes, potatoes as hair and 3 sausages as the smile which I thought was a cute and a pretty good deal, espeically for the kiddies. There are 2 pancake sections, one thick, one thin with 9 choices each priced between $6.50 to $10.95. On the healthy/vegetarian side, you get 6 types of bagel dishes ranging from $3.35-$9.95; fruit cups were also available with a small pricing at $7.25 and a large at $10.50 (served with yogourt and coffee). What actually caught my eye was a specialty section with dishes based on an ingredient. The first one was spinach and it had various omeletes and crepes with spinach as the key ingredient where the prices ranges from $9.50-$10.95. The second one was Nutella and it offered crepes and French toast all with Nutella ranging from $8.75-$10.95. 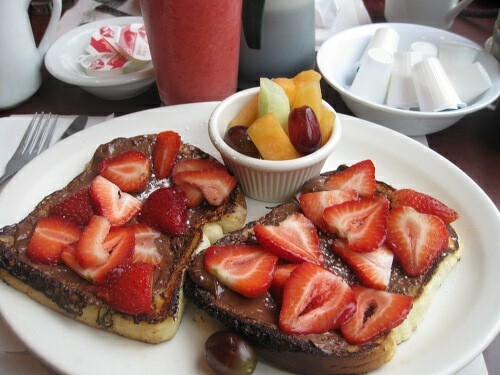 I ordered from the Nutella menu and had French toast with Strawberries and Nutella ($10.75) which came with 2 slices of French toast, a healthy amount of Nutella, a layer of strawberries and a small fruit cup. The taste was amazing and the Nutella really took over the French toast yet the strawberries stood out and offered a nice counter to the hazelnutty and thick taste of the Nutella: I felt it was a nice pairing but I wish there was a little more fruit selection since I only got a very small bowl. In the end, however, I was full which was important to me especially since I was really hungry that day. I also had a smoothie which was a raspberry although I did not note the price but I recall it being in the $5 price range. The taste was really fresh and thick and our waitress gave my friend some of the extra from the blender in a smaller glass for free. Needless to say we were all happy. My friend went the healthy route and ordered the fruit plate ($10.50) which had yogourt, honey, an assortment of fruit from kiwi to bananas, strawberries, grape, cantaloupe, apple, orange and grapefruit. The fruit was fresh, as was the yogourt . Our waitress was amazing, she was really nice polite, and sociable and she even gave my friend a free smoothie with the leftover that was used to make mine. Our coffee refills were very frequent and she was helpful with our menu questions. There are vegetarian options here, in fact most of the menu items are without meat and they also have a nice bagel section which not everyone else has and the omelette selection is quite impressive. I could not find any vegan dishes although you can probably ask for some dish and customize it since the staff was very accommodating. 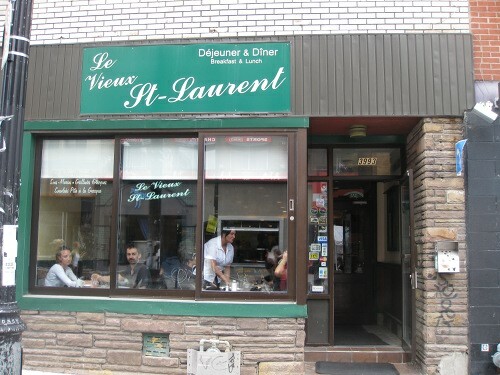 I was very impressed with Le vieux St Laurent. It is not fancy in any way shape or form, but it is comfortable and well priced with most dishes under $10. If you want a classic hearty and tasty breakfast do give it a try and I’m sure you will love this little St.Laurent treasure. Monday – Saturday 6:30 a.m.- 4:00 p.m.
Sunday 7:30 a.m.- 4:00 p.m.